A birthday celebration only happens once a year, but what I love about photography is that photos have the unique ability to help people relive party memories any day. 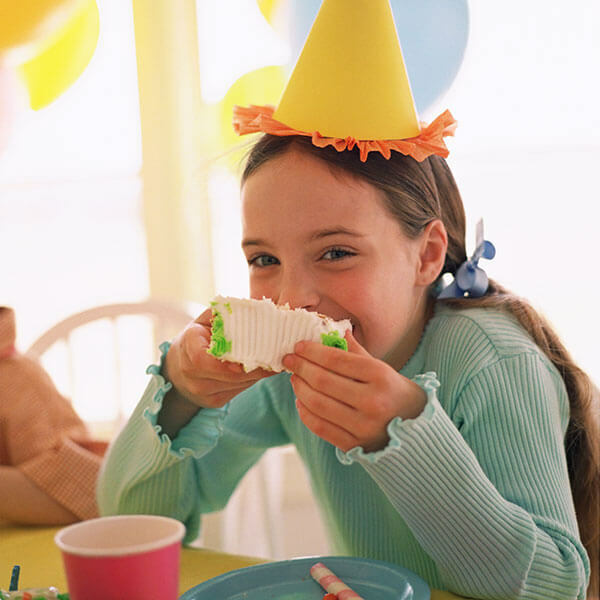 To capture the best birthday pictures (and memories) that you’ll smile and laugh about 20 years from now, try these birthday photo tips. Pull out photos taken from previous birthday parties or moments captured throughout the year, and use them as part of your party decorations. It’s a great way to honor your child and add a personal element to the festivities. Keep the photos in an expanding book that you can add to each year. It will be something everyone can enjoy perusing, including your child when he or she goes out on a first date! 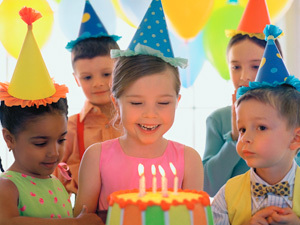 When setting up a birthday party, have fun and play around with all of the elements that make up the party. There is no right or wrong way to decorate, so be creative. Look in magazines or online for inspiration. Once you’re all set, document the details of the decorations that you’ve worked hard to create. For example, a close-up of the cake you baked (or bought—nobody’s judging! ), the pretty wrapped packages and the party games and favors. A camera strap allows you to keep your camera around your neck and powered on so no time is wasted fumbling around or searching for the camera. Being prepared with the camera on hand can help you capture authentic, in-the-moment photos. Position yourself in various places throughout the room. A simple change in location could provide better lighting, a background that makes your subject pop or an angle that allows you to see facial expressions better. Pay attention to the details and what is going on in the room. Capture the icing that fell on your kid’s foot that the dog is licking up or snap a photo of the girl trying to scoop up a big piece of cake on her little fork. Snap a photo of kids laughing together or the reaction of the child who gave the gift to the birthday celebrant. Kids are very aware of the camera, whether they love it or shy away from it. To capture the true personality of a child, try to be discreet with your camera; catch them when they aren’t looking. 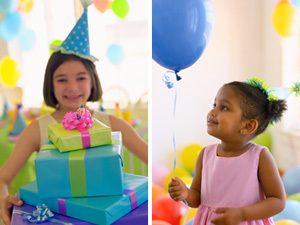 Or provide photo props, like party balloons or a flashcard featuring the age of the birthday boy or girl, that help kids forget about the camera. The goal is to capture true expressions and help everyone create fun memories. And remember, you can share the photos with party attendees after the party via a photo thank-you note or an online album shared with the other parents. If you want to get away from the standard birthday cake picture, try some of these suggestions to capture one-of-a-kind birthday photos. DIY photo booth: Create the photo booth magic in your own home. Set up a corner of the room with a backdrop, such as a sheet you or your child decorated, and provide a box of dress-up outfits and accessories kids can use to pose for the camera. Here are some ideas: sunglasses, boas, ties/bowties, hats, helmets, mustaches, handkerchiefs, costume jewelry, chalkboard signs for writing their names or funny sayings, printed signs with words—the sky is the limit. The accessories can relate to the party theme or they can feature props that show how the kids are connected—school colors, a soccer ball or ballet tutus. Hats off to headgear: Have all the attendees wear party hats, ones you provide or ones you have them decorate. Make sure the birthday honoree has a special party hat. Again, the child can decorate his own, or you could have all the kids help decorate it. Have them all stand around the birthday boy or girl and strike a pose. Dress the part: If you have a themed party, ask the guests to dress in clothes that relate to the theme, or ask them to wear colors from the theme and arrange them accordingly. Arranging the partygoers: You can line up the kids in different combinations, all in one line or stagger between front and back. Bring in some chairs, benches or stools for some to sit on to make the photo a little more interesting. Line them up by shortest to tallest, girl-boy-girl-boy, back-to-back or linked like a train, and as you are snapping, shout out different emotions for them to act out: “Everyone be silly,” “everyone be mad,” “everyone look scared” or “everyone act surprised.” This always helps to break the ice and make stiff kids liven up, and when real emotion comes out. Once you get a wide shot of all the kids, jump in close and start snapping while they are in the moment of interacting with each other, as they tend to do when they are being silly. Give me a “B”: Think of a word to spell out (like the birthday boy or girl’s name, age, nickname, “Happy B-day” or a just a silly word) and have each kid hold a letter for the camera. You can write large letters on paper or cardboard, or you could have the kids make and cut out the letters. You can always buy ready-made letters at craft stores, too. Danielle Mousley likes to keep things interesting. During her tenure with Hallmark, she’s designed funny greeting cards, set up stylish photo-shoots and blogged about all kinds of interesting aspects of her work. And to her, tackling triathlons is one way to keep her fitness routine fresh. We get short of breath just thinking about keeping up with her!